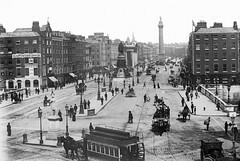 This beautiful shot of Sir John Gray's monument and a pristine Sackville Street, (O'Connell Street) taken in the early morning, The street is clear apart from some hackneys waiting for fares with Nelsons Pillar standing proud and the GPO in all its grandeur unaware of the devastation to come! No sign of electric trams yet, so definitely before 1896. ...or perhaps not: the first electrics reaching Nelson Pillar from Clontarf on 19th March 1898. It is busier, but the camara of that period did not reflect movement. Jacob Tweedell was at #39 in 1879 and 1882. Adolph Lesage was next door in 1862. And as late as 1880 per this page. 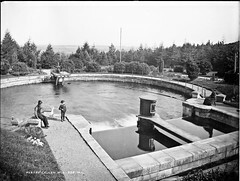 The NIAH says that Originally the sculpture was surrounded by cast-iron railings but does not say how long they lasted. [https://www.flickr.com/photos/angelfigueiras] No, we love your photo! [https://www.flickr.com/photos/beachcomberaustralia] There's a Prince of Wales Hotel in that one. Maybe [https://www.flickr.com/photos/gnmcauley] can dig up a date for it. There's also an Appleyard, purveyor of illegible mysteries in number 36. Appleyard was there in 1862, apparently. Selling socks from Balbriggan and other such delights of the orient. On the Prince of Wales, Archiseek says: The Hotel Metropole was a landmark in Dublin, located next to the General Post Office building in O’Connell Street. Originally four Georgian buildings combined together to form a hotel and known as the Prince of Wales, the building received various architectural embellishments to visually tie them together. Remodeled internally and externally by William M. Mitchell in 1891-93. The DIA says it got a "cement front" in 1860, which is what we are seeing here, I think. The Metropole entry suggests it was renamed near the 1891-2 date: 1891-93 Nature: Remodelling of former Prince of Wales Hotel So no help - our range is still 1879 (statue) to 1892 (railings gone). So close! This archived Chancellor shot is dated precisely to July 1888, but the quality is not good enough to tell if the railings are there. In the STP with the prince of Wales above, we see #35 is S. COWEN. In 1862, #35 was William Robertson, bookseller. I think (squinting) that S. COWEN is also a bookseller. By 1901, there is only one S. Cowen that looks even possible, Samuel Cowen, Commercial Traveller, 63. 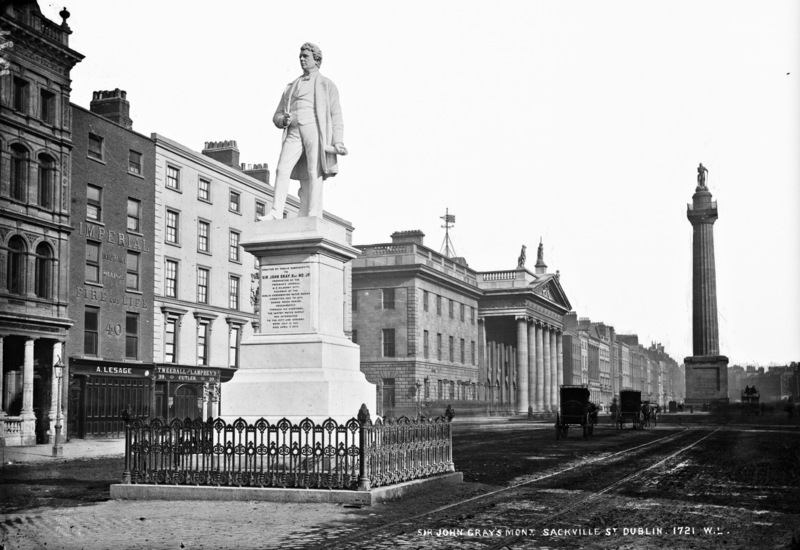 The Irish Times Archive gets hits for "Cowen Bookseller Sackville" from 1875 to January 1880, but not later. In 1875 the hits are for Cowen & Thomson, 1879 are for S Cowen. "Thomson Bookseller sackville" gets hits up to 1877. I think we are in 1877-80. 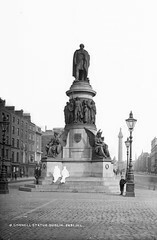 Add in the statue, and we are after June 24th 1879 and before 1881.